There are three options: Lapband, the “sleeve”, and “gastric bypass”. Each has its benefits and drawbacks. How did I do it? I had bariatric surgery for the Lapband. The major plus for me and why I chose the Lapband is because it is reversible. The others are not. However, I’ve spoken with fellow patients who have had the sleeve or bypass and they’re pleased with their choice and the results. Whichever method, you need to discuss it with your doctors and investigate it carefully. The Lapband is a device inserted into your belly that wraps around the stomach and serves to constrict it, forming a smaller stomach pouch before the rest of the stomach. When you eat something, it goes into the first, smaller part of the stomach above the band. The food will sit there for a while helping you feel full. It can also cause you to throw up if you eat too much and too quickly. The successful part is that you stop eating as much and you reduce your weight. For a year (or more), you should return to have an “adjustment” to the band to either increase or decrease the amount of fluid in the band and thereby tighten or loosen the band. After an adjustment, you drink some water and make sure everything is okay. The downside is that some people don’t follow the schedule for “fills” or increases in the tightness of the band. You should have adjustments for specific periods after the surgery. If you don’t then there’s not much benefit and the weight comes back. That’s my biggest fear. I’ve worked too dang hard to reduce. I don’t want it coming back! 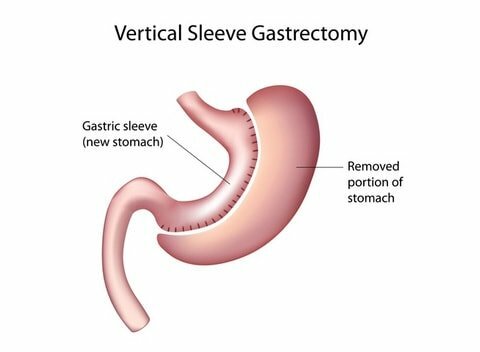 The sleeve procedure is when the surgeon staples part of your stomach closed and removes a major portion to make it smaller so you can’t and don’t eat as much. It reduces the stomach to about 25 percent of its original size. A new “stomach” is created is the shape of a sleeve. The pyloric valve, which is a normal outlet that controls the release of food from the stomach to the small intestine, continues to function normally. 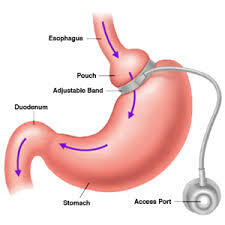 Gastric bypass surgery refers to a surgical procedure in which the stomach is divided into a small upper pouch and a much larger lower “remnant” pouch and then the small intestine is rearranged to connect to both. Surgeons have developed several different ways to reconnect the intestine, thus leading to several different gastric bypass (GBP) procedures. Any GBP leads to a marked reduction in the functional volume of the stomach, accompanied by an altered physiological and physical response to food. 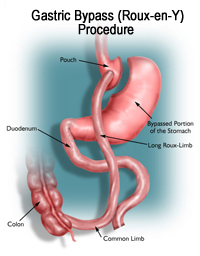 As you can see in the image, the stomach and a large portion of the intestines are bypassed. This procedure is very serious as it cannot be reversed (or no one has developed tha procedure yet). However, in some cases a doctor may advise it and/or the patient requests it. So, why is this important? Why should obese people on dialysis reduce their weight? There are several very good and reasonable purposes for weigh reduction in dialysis patients. The first is because it eliminates the amount of fluid you can retain. Less fat means less water retention. When I was “fatter”, I could take off 6 kilos. That’s a lot. Now, I’m retaining about 3 kilos over a weekend and 1.5-2.0 kilos during the week. That is a radical difference and means I’m stressing my body that much less. This entry was posted in CKD, dialysis, diet, dietary restictions, fluid control, kidney, Kidney Diet and tagged CKD, dialysis, diet, fluid, hemodialysis, kidney, patient. Bookmark the permalink.